HTC has a long and proud history in the mobile industry. From their early years as an ODM (original design manufacturer) making phones and mobile devices to be branded as HP and Palm, HTC have grown through leaps and bounds to their current standing as one of the leaders in design and mobile innovation. There’s been some trying financial times of late, and last years HTC One was described as their last ditch effort to save the company. But that wasn’t the case. The One wasn’t as successful as it might have been, and yet HTC has remained staunch in the face of adversity and produced this years HTC One (M8) as a way of proving their doubters wrong. The HTC One (M8) launched– hold on, let’s just address this here and now. What in the heck were HTC thinking? Last year’s HTC One was technically the HTC One (M7), and this years is the HTC One (M8). The M7/M8 designation is really not part of the name, and it leaves us with two products basically sharing the same name. For the sake of simplicity, we’ll be referring to the HTC One (M8) simple as the M8. The M8 launched with slightly less than a two week head start on their number one competitor the Samsung Galaxy S5. This two week head start is slightly longer than the 4 day head-start than HTC had last year in Australia, and judging by informal chats with carrier stores, sales are going quite well. HTC launched the M8 in three colours – Amber Gold, Gunmetal Grey, and Glacial Silver. The three Australian carriers — Optus, Telstra and Vodafone — have only stocked the Gunmetal Grey version though. Virgin Mobile has chosen not to carry the M8 at all. The version available through Australian carriers can be purchased on a variety of plans, or you can purchase it outright from retailers for the RRP $899, or from importers or online for a bit less. Outright availability is a bit dicey at retail, with some JB HiFi stores claiming that the handsets are locked to Telstra, so research carefully. The carrier version of the M8 is a 16GB version. There was a 32GB version announced but it hasn’t made an appearance here in-store as yet. The retail version of the M8 contains the phone, MicroUSB cable, Power plug and a basic plastic case/bumper. There’s a SIM ejector pin and a wired headset with an action button as well. The packaging is very, very similar to the 2013 HTC One. Accessory wise, there’s a nicely engineered top-shelf accessory, the HTC Dot View Case, which has it’s pros and cons which will be the subject of its own mini-review. If flip covers really aren’t your cup of tea, the Double Dip cases that were made available for the original HTC One are making a comeback for the M8. Basically a bit of colourful armour for your M8. Last year’s HTC One spawned a few offshoots, such as the One Mini and One Max. Seen as an attempt to re-invigorate the product, they weren’t the most successful (or enjoyable) devices, but none the less, they each had their target market. The signs are good that HTC plans to do similar with the M8 this year, but we’re not talking about the future. We’ve had the M8 for a little while now, so let’s review it shall we? Put simply, the M8 is a step-up from the original HTC One in most respects. While the original had a Snapdragon 600, HTC has chosen to go with the fastest processor available at this stage – the Snapdragon 801. This chipset is clocked at 2.5GHz for the Australian version, while international US/European version gets a 2.3GHz version. The Snapdragon 801 comes with an Adreno 330 GPU, and the phone includes 2GB RAM making for a fast experience. The phone comes with a lovely 5″ Super LCD3 screen; it’s a slightly larger version of the same screen from last years HTC One. But even with a 0.3″ larger screen, HTC has only just slightly increased the overall size of the phone, but even HTC with their great design sense hasn’t been able (or willing) to remove the bezels completely. There’s BoomSound speakers installed on the M8, and HTC has said that they have continued to refine the BoomSound technology, with an emphasis this year on clarity as well as ‘Boom’. As mentioned above, the 16GB model is currently here in Australia, and there’s a 32GB being manufactured, but as to whether we’ll see it here is unknown. While 16GB of storage isn’t a lot — and there’s less actually available, after the operating system takes its share, around 10GB when you first load up the phone — HTC has chosen to include a microSD card slot with the M8 which is a pleasing option to see. It’ll take cards with huge capacities up to 128 GB, but with Android 4.4’s changes to how SD cards can be used, it’s really only useful for music, photos and movies. The Cameras. There’s an astonishing three cameras on the M8, the highest MP resolution is actually on the front-facing camera which is 5MP, the rear camera is again the same UltraPixel sensor from the original HTC One, a 4MP with 2.0µm pixel capacity. The third camera facilitates the M8’s signature party trick of allowing depth of field to be changed once a photo has been taken. The M8 is made of the same aluminium material that last year’s phone was made of, but HTC has increased the amount of aluminium used, with HTC advising that the One (M8) uses 20% more metal, and it shows. The plastic which lined the edges around the previous model is gone and makes for a very pleasing feel in the hand, with the M8 seemingly conforming to the hand making it feel very comfortable to hold and use. The Gunmetal Grey Alumunium body gives the M8 a premium look, and with the gently rounded back the phone sits comfortably in the hand – it feels great. But there’s some downsides to having an all metal body. Put the phone in a car mount, turn on the GPS and plug it in to charge and the phone begins heating up. With the addition of a Bluetooth connection to a car stereo and add in the heat from the midday sun – especially in summery QLD – and I was unable to hold the phone when we stopped due to the heat. There’s also the somewhat tricky subject of the phone being slippery. The aluminium is definitely nice to feel as opposed to the plastic of some other phones, but it’s slippery. I love to read an ebook on my phone in bed, but the phone is slippery to hold and the volume rocker on the right which is normally used to turn pages, is awkwardly positioned for this purpose. But getting back to slippery, I have dropped the phone on my head on no less than three occasions when it slipped from my grasp. 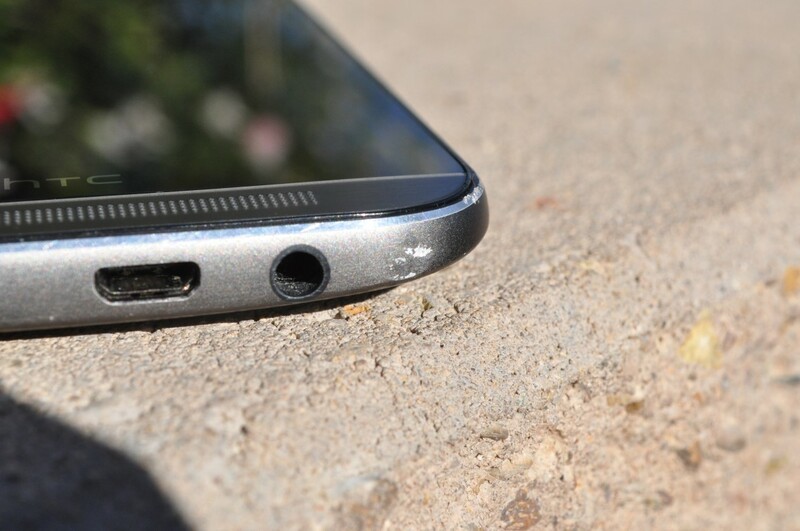 It’s edge case, but I have seen more than one person comment on the finish of the M8. There is another side to the aluminium case, the material is definitely not as forgiving as others available. A meeting with the floor could both mar the colouring, as well as dent the body at the same time. There are no flaws in the manufacturing of the phone, in the review models that HTC distributed and in the retail models I’ve seen since. A good sign after the issues that HTC had with some models last year. HTC has this year eschwed the capacative buttons of the original HTC One, going with the onscreen buttons that Google introduced in Android back in Ice Cream Sandwich. They have left in the black plastic strip with the HTC Logo beneath the screen however. This does seem a little self-serving, but it pays to remember the antenna, components and circuitry for everything behind the scenes have to go somewhere, and this is a small price to pay. HTC has placed the power button for the M8 at the top of the phone again, with the volume rocker on the right hand side of the phone; a somewhat difficult proposition for people used to the somewhat ‘standard’ setup of having the volume rocker on the left and power on the right. At the bottom of the phone is the microUSB plug (upside down) and the 3.5mm headphone jack. HTC has placed the BoomSound speakers behind some extremely high quality CNC machined holes. Run your fingers over the holes and you’ll be hard pressed to actually feel them. Obviously when you look at a phone, the screen is the first thing you look at, the screen on the M8 will satisfy most people who use it. The screen is bright, text is crisp and produces a beautiful array of colours. The screen is 5.1” in size, but has been squeezed into a phone body that is very similar in size to its predecessor. The one thing that HTC has not managed to do is shrink bezels on the sides of the screen. There is a consistent 4mm bezel around the entirety of the screen – except at the bottom where that black bar makes an appearance. It’s worth noting that Samsung’s Galaxy S5 has a similar bezel around all edges of its flagship, and its a lot more noticeable. The screen on the M8 again uses the Super LCD3 screen technology that was present on the previous model, but with the screen now at 5.1” and again at the 1920×1080 resolution, there’s a loss in pixel density. The M8 has almost 432 ppi vs almost 469 ppi on the original, but it’s not noticeable. Ahh, battery, the bane of every portable device. HTC has packed a non-removeable 2,600mAh battery into the M8, a respectably sized battery for a modern day smartphone. Real world use? I am generally up at 5-6am and go from there, I use my phone A LOT, admittedly more than the average person. By a lot, I mean, syncing 3 GMail accounts, podcasts, exercise tracking using GPS, constant Twitter and G+ usage, web surfing and even tethering, by 3pm I am generally desperate to find any power source possible to charge the phone. Chris, who’s also been playing with an M8, has reported the battery life is quite good, on average lasting a full day without needing a charge. Heavy use will drain the battery quite reliably, but with an average day of use, a full day (8 till 8) is quite achievable. HTC is employing a software side to battery management in the form of ‘Power Saver’. 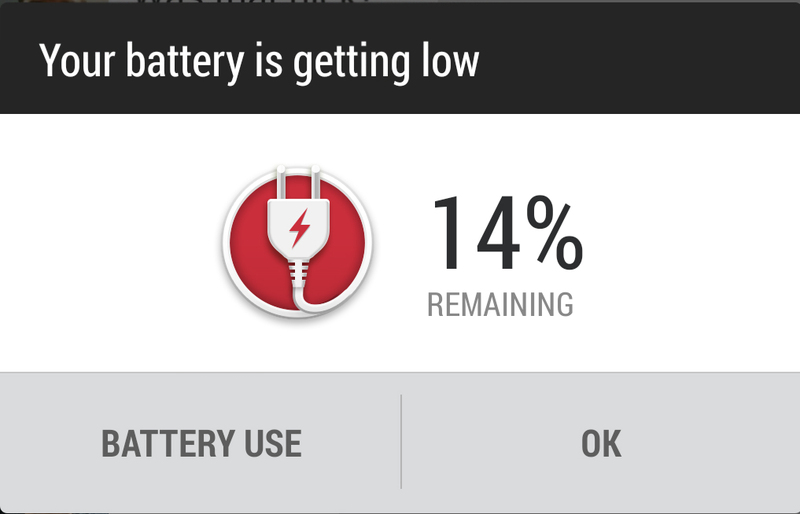 At 14% remaining battery power, the Power Saver function kicks in, powering down unneeded functions on the phone. Power Saver has options to Conserve CPU Usage, Reduce Screen brightness, Turn off vibration feedback and turn off the data connection when you put the phone to sleep. You can control which of these options are included by selecting or deselecting them in settings. Unfortunately, because I use my phone a lot, ‘Power Saving’ is of little used to me. I just need more battery.There will be in the future an ‘Extreme Power Saving Mode’ which will reportedly give up to 30 hours of standby with just 10% battery left. It’s apparently already available on other models released around the world, and HTC will release this feature to Australian models at some stage in the future. If there’s one thing I find useful with the Nexus 5, it’s wireless charging. The M8 has no Qi charging built-in, nor will it have the option to add it à la the Galaxy S5. With a heat conducting aluminium body, this is probably a good thing though. If software settings aren’t enough for you, there’s options for the M8, but only in the form of accessories. The M8 with its Qualcomm CPU supports Quick Charge 2.0, the supplied 1.5Amp charger won’t help with that, but a new 1.67A charger to be released later this year will. Likewise, if you require a boost on the move, there’s a 6,000mAh portable battery available. HTC has included three cameras on the M8. At the nuts and bolts level, the main rear camera is a 4MP UltraPixel sensor with 2.0um Pixel size, yep, the same one that was included on the M7 – minus the Optical Image Stabilisation (OIS) that made the original quite awesome. The rear camera has a ‘companion camera’ with a 2MP sensor, which HTC uses to create their ‘Duo Camera’ effect which allows them to do some interesting things with depth of field and 3D manipulation. Finally, there’s a 5MP camera on the front of the phone for video conferencing, or ‘selfies’. At its core the camera on the M8 is pretty decent. It takes some good shots, in well lit areas, but most cameras on phones will take a decent pic in well lit areas. The real measure of a phone camera is its low-light performance, or situations that are other than ideal. The M8 takes a reasonable photo, but it’s not the same as the HTC One it replaced – the M8’s lack of OIS hurts its low-light performance. 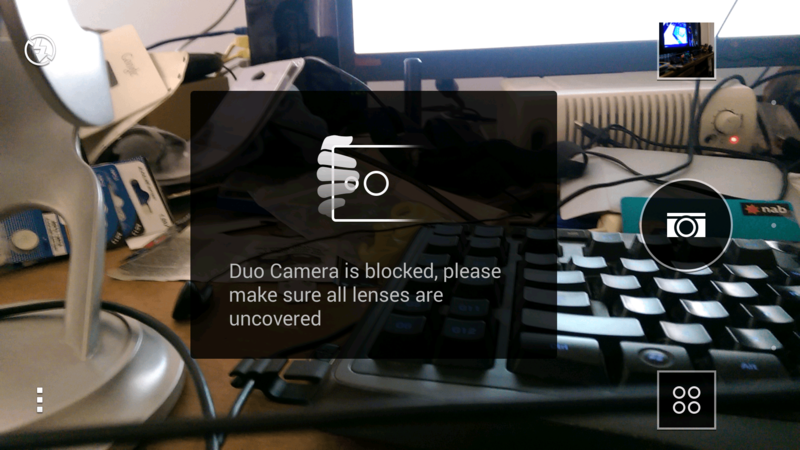 The camera on the M8 also suffers from the same issue that the camera on the M7 suffers from. With a 4MP sensor, photos look pretty good until you have to zoom in or crop to frame your subject. Considering that other phones have been featuring cameras with up to 13MP sensors with brilliant low-light performance (e.g. 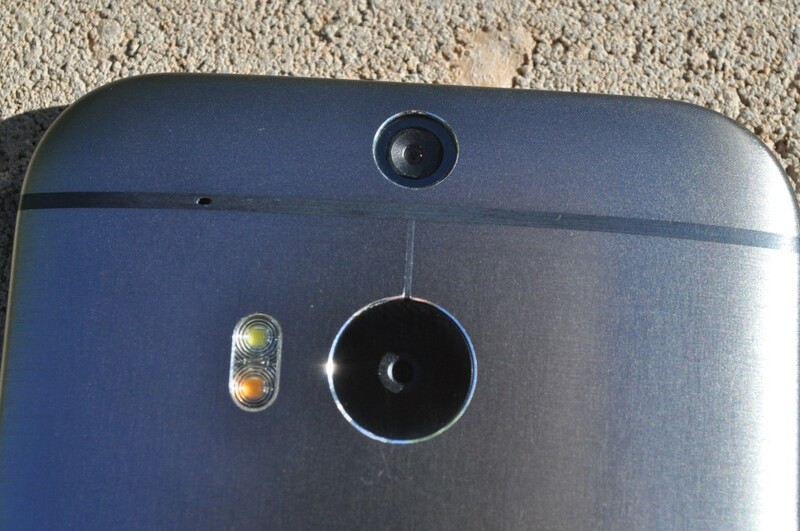 the LG G2), HTC’s continued reliance on its 4MP UltraPixel sensor is a bit of a disappointment. Where the M8 makes up for its lack of pixels is in the addition of features, enabled by the dual cameras on the rear of the phone. The M8 can do some clever tricks with background and foreground focusing — the dual camera setup on the M8 has allowed HTC to introduce a few software effects that allows you to edit depth of field and play with 3D perspective. There’s three main effects that are available in the ‘Edit’ menu once you’ve captured your shot: UFocus, Foregrounder and Dimension Plus. Note, though, that these don’t work with close up shots — you need a little bit of distance between the subject and your camera for these features to be enabled. UFocus will allow you to effectively select an object in the foreground, middle or background of a shot and bring it into focus. Foregrounder takes the foreground, middleground and background idea from UFocus and then instead of simply unfocusing the unused portions, applies a filter like effect to those portions. There’s four options to choose from: Sketch, Zoom Blur, Cartoon and Colourize. Dimension Plus adds a parrallax effect to the photo using the depth of field information from the camera. It’s seemingly limited to the phone, as you use the acceleromters in the phone to control the effect. Simply move the phone and on the screen you get a very 3D-like effect. It’s pretty easy to achieve these shots, but you have to take some care. The depth of field relies on you making sure that the initial subject of the shot is in focus — just taking a random shot doesn’t mean you can bring an unfocused object into focus later. It also doesn’t work if the flash is on, or if you cover the second camera, but you’ll be warned about that one. The effect isn’t quite as seamless as that produced by say a Lytro camera, but it’s close. Once you’ve gotten your shot, you get some cool effects by accessing the edit menu. The camera software is pretty well laid out, however there’s a lot of menus to explore. If you’re in need of a specific effect, setting or more then you may have to dig through a couple of layers of menu before you find your setting or effect – and believe me there are a lot of them. From filters, to ISO settings, White Balance, and even basic options like changing the filenames you use. The plus side is that you can change this stuff — some phones don’t let you. Thankfully turning the flash on and off is simple, but you will actually want to use it. HTC has included a Dual Flash, a two-toned flash which offers different colours intended to make for better flash photography. It works well, but you’ll still probably want to rely on that fancy larger pixel light sensitivity than the flash. The video on the M8 is – as is to be expected – fairly decent. There’s been no addition of 4K video or slow motion capture added, it’s simply a decent FullHD capable video on both front and rear cameras. It’s a good camera, but it’s not a great camera. There’s some great effects on offer here, and they are quite a lot of fun. HTC has even resorted to statistics on how often people use filters and effects to guide them through what matters to people on a camera. What I and many people would love to have seen though, is an UltraPixel camera writ large – an 8MP UltraPixel sensor with the OIS retained would have made for a more logical and impressive update to the camera. Modern smartphones contain just about any type of connectivity you could ask for – WiFi, Bluetooth, GPS, NFC, FM Radio, even these days Infra Red, and the M8 includes all of these. There’s quick settings for most of these wireless and wired connectivity options in the quick settings toggles in the notificaitons shade. There’s WiFi 802.11 a/b/g/n/ac, Wi-Fi Direct and you can use Wi-Fi hotspot. The phone connects easily to Wi-Fi, with the sole exception of a random hotel wifi hotspot that the phone just refused to see and maintains connection. The Hotspot function works like a charm, although drains battery quickly which is totally normal. There’s two ways to get display out of the phone and on to TV, the first is the modiied WiDi connection Miracast, which the M8 supports with no issues, and MHL, both work well. I would like to interject that having both Slimport and MHL adapters handy is a great but hard on the amount of HDMI inputs on a TV, this probably should be standardised… right, Chromecast? NFC works as you’d expect, and as usual the FM radio requires a wired headset to work, but work it does. I even had use for the FM radio when stuck in an area with no mobile reception with no way to stream music or download podcasts. For the last two years, HTC has included an IR blaster on their flagships, and it’s wonderful. You invariably will have your phone on, or near you and not having to hunt for a remote that’s often fallen down the back of the couch is fantastic. SenseTV has limited built-in function, in that there’s not many devices pre-programmed into it, but the learning function allows this feature to be infinitely more useful, IF you want to put the time into training it. Out of the box, so to speak, HTC TV can control most televisions, most set top boxes and home theatre setups (insofar as sound is concerned), but other things like DVD players are curiously omitted. You can, if you’re so minded, program these functions in, but be prepared to spend quite a bit of time doing it. There were hiccups in both the Bluetooth and GPS functions though. I run. Well, I jog, and I enjoy it, and I like to map my runs using My Tracks, but I’m not married to it and have used – and tested – others like Runtastic, Map My Run etc. I also like to use my Bluetooth earphones to run with so there’s no cables flapping around. I also use a Pebble and a Fitbit Zip and happen to be reviewing the Jawbone Up24. So, that’s four Bluetooth devices + GPS, it’s an edge case, but the M8 struggled to keep up. I had problems mapping the running tracks with GPS, a nearly 8km track I had measured in the car was less than a km according to the GPS on the M8. I also had issues with getting Bluetooth audio to my earphones with the sound continually cutting in and out. A reboot of the phone sometimes fixed the GPS and Bluetooth issues, I also tried leaving my Pebble and all but one fitness tracker at home, no difference. I have basically taken to running with wired headphones for the term of the review. Chris has also experienced these Bluetooth issues on the M8, but not quite so noticeably. The M8 paired easily with a Hyundai Bluetooth head unit in an i30, but not reliably so — most phones automatically connect to the head unit when starting the car, but the M8 did not, preferring to be forced rather than doing it voluntarily. Equally, connectivity with a Pebble Steel was hit and miss, but this seemed to be attributable to the Pebble app rather than issues in the Bluetooth stack. Happily, voice calls and data connections work fantastically on the M8, and while I couldn’t test the Optus 4G Network in Canberra — yep, no 2300MHz support in the M8 — it works plenty well on the 1800MHz LTE frequency used more commonly throughout Australia. 3G also works with a strong HSDPA signal allowing me to really continue to test out the capabilities of the Optus $2 days unlimited data – spoiler: 42GB last month, through 3G. Boom. HTC is now wholeheartedly backing BoomSound to show off their audio chops. The M8 doesn’t have sound. It has BoomSound. Boom. HTC has included the dual front-facing speakers atop and below the screen on the front of the M8. HTC has made the BoomSound that eminates from these speakers 25% more powerful and put more emphasis into better clarity. For the most part it’s a great sound, the forward facing speakers are loud and clear. I have no complaints, but you just don’t often use them. Most of the time you’re using headphones. But HTC has also been working on support for the headphone wearing majority out there and BoomSound covers you there too. Whether you need louder sound to hear your tunes over your thumping footsteps on the treadmill at the gym, or straining to hear what the presenter is talking about on a podcast while the hoi polloi shout on the train, the sound on the M8 is a delight and will please most people. The HTC One (M8) is fast – yes I wrote it’s full name for that, it deserves it. HTC has worked magic with the M8, it’s fast, fluid and responsive. Touch response on the phone is impeccable, it also loads applications swiftly and lag is very much a thing of the past. Australia and indeed a large portion of Asia has received a variant of the M8 which includes a Snapdragon 801 processor clocked at 2.5 GHz as opposed to Europe and the US which received a version clocked at 2.3GHz. It’s not much of a difference at this end of the spectrum on a Quad-Core CPU, but for the Australian model, it’s fast. If we’re going to do benchmarks, we use Geekbench, mainly due to having results from previous devices, although HTC has recently been caught manipulating bench tests. For gratification, the M8 received a 537 Single Core score and a 1677 Multi-core score on Geekbench. HTC has launched the M8 with the latest version of Android – 4.4.2 (KitKat). Of course, this being HTC, Android has been given some cosmetic surgery with the inimatable HTC Sense. Sense 6 has been released with the M8, which of course means the HTC marketing team has taken to calling it ‘Sixth Sense’. Har har. With a name like ‘Sixth Sense’, you’d be forgiven for thinking perhaps HTC had worked on some special sauce type contextually aware or pre-cognitive system that anticipates your needs, and with Motion Launch there’s a hint of it, but essentially what we find in Sense 6 is an updated Blinkfeed and a toned down version of Sense. Let’s face it, when Android first arrived, it was utilitarian, functional and it worked after a fashion, what it wasn’t was beautiful or even visually appealing to a great extent. Bear in mind, this is coming from a massive Android fan. In the early days, HTC used Sense to add the flair to an OS designed by engineers, but as Android has matured and become more beautiful, the need for Sense has really been left behind. Android now has real designers and an acknowledged master designer in Matias Duarte, and it seems in Sense 6, HTC has finally recognised this. Sense 6 adopts a deferential approach to the flat Android 4.4 design. We’ve seen a lot of manufacturers really butcher the visual signature of Android, and with Sense 6.0, HTC have complimented it rather than destroying it. HTC’s apps look comfortable within Android’s design guidelines rather than striking out in their own direction. It seems after years of promising that they’ll tone Sense down visually, that HTC has accepted this flat design on much of their interface. There’s still lingering visual cues which ensures you’re aware that this is definitely a HTC Sense phone – dialogue boxes, the settings menu all have that distinctly HTC look, but it’s acceptable, even pleasant, and definitely not gouge-your-eyes-out-horrific as some previous iterations have been accused of being. Instead of making the visual changes normally associated with Sense, HTC have gone back to one of the core tenets of what made Sense great originally — adding functionality. For example, you can change the lockscreen wallpaper, or easily customise your lockscreen shortcuts by changing the Apps in the dock. Changing lockscreens is a basic function, and by comparison, the hero of Sense 6 is Motion Launch. Motion Launch is all about making your life easier by using everyday gestures to make the M8 an easy to use experience. Double Tap — Pickup the phone in portrait orientation and double tap to wake. Swipe left — Pick up the phone in portrait orientation and swipe left to wake phone and launch the widget panel. Swipe Right — Pick up the phone in portrait orientation and swipe right to wake the phone and launch BlinkFeed. Swipe Up — Pickup the phone in portrait orientation and swipe up to unlock. Volume Buttons (in landscape) — Pick up the phone in landscape orientation and press the volume button to wake phone and launch the camera app. Double tap to wake is fantastic. I first encountered this feature on the Nokia Windows Phone range, I’ve also used it on the LG G2 and G Flex phones, but it’s been a pleasant surprise to find the HTC implementation is one of the best. Better yet, it works through the Dot View case allowing you to quickly see the time and weather with a simple tap on the screen. No buttons needed! Blinkfeed has received some love from HTC in Sense 6 as well. For a start, HTC has over 1000 sources of news in Blinkfeed already — yes, Ausdroid is one of them — and also now allows partners to integrate their own content into Blinkfeed. This should make Blinkfeed a little more attractive for a broader audience, and HTC is definitely looking at building that broader audience. HTC has released Blinkfeed into the Play Store with the intention of allowing any Android device access to it. HTC says they will make it available sometime in the ‘Summer’, Yep, that means Winter in Australia, or July as we were told at the Australian launch. Blinkfeed has actually become quite a popular feature for HTC owners, with many swearing by the application to give them a full overview of their new, social feeds and more, with things like Sense TV reminding them when their favourite shows are on. I just can’t get into Blinkfeed though. I find myself wanting to use it, but I am just way too specific with my news and social media habits to have it fed to me in an aggregated feed. I did find it an excellent tool for keeping up with Facebook which I rarely use, I was more up to date with family goings on through Facebook during this review than I have been in some time. HTC has recognised the leaders in the fitness wearables market and partnered up with Fitbit to include the App on the M8. This is a deep partnership though, with the sensors on the phone able to be used to track your steps without any additional Fitbit hardware. An additional benefit of this partnership is that Fitbit has updated their App to include Fitbit Badges in Blinkfeed. In practice, while the Fitbit integration is pretty cool, it’s not terribly exact. If you have a separate Fitbit tracker, you’ll find you get more accurate step counts from it, and you can still use it to track sleep, workouts, or any other time you leave and put your phone down. Overall, the fact you need your phone on you to track steps is a bit of a problem. If you leave your phone at your desk and wander off to do something, that’s a whole heap of missed steps. If you carry a separate Fitbit tracker as well, you’ll also end up doubling up on steps. Essentially you may as well just continue using your Fitbit. They really could work some intelligence into this, but it’d require a bit of effort to make it happen. Maybe in a future update they’ll figure out how to use both measurements instead of simply doubling up. We’ll see. HTC has done pretty well over the last few years, supplying accessories for their phones. There’s a full range of accessories available from their online store, and they’ll be selling them through the retailers but in fairly limited numbers. Last year they introduced the Double Dip cases and they have brought these colourful plastic shells back for a second year for the M8; but it’s the Dot View Case that is the star this year. 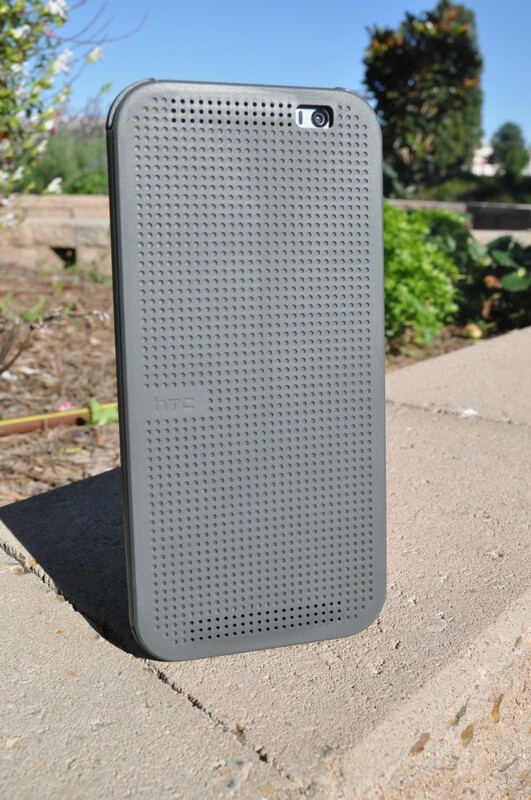 The Dot View case, is a flip cover with a dotted see through flap which allows information to come through. It’s a smart cover and uses magnets hidden beneath the HTC logo to activate the Dot View mode on the phone. The cover itself is made of a rubberised flap attached to a more sturdy plastic shell which conforms to the M8, like, well, a tailored suit. The case supplied by HTC for our review is a fairly boring grey, but there’s a range of colours available – Warm Black, Imperial Blue, Orange Popsicle, Atlantis and Baton Rouge. And it’s not cheap, to own one of these you’re looking at parting with $50 to $60 depending on where you shop. But it’s not just pretty to look at, it’s functional, rather than being limited to a small window to access, the Dot View case allows you to use swipe functions without opening the flap, while also displaying information in a very cool, dot-matrix style. As a basic screen when activated, you get the weather and time displayed, but it will also display caller ID information as well. At this stage HTC has not, and has no plans to release an SDK for third parties to feed information into the Dot View Mode, but from the reaction of Darren at the HTC Launch, this is something they will be looking into. With the whole screen available to use, you’re able to use swipe gestures, like the double tap to wake, just like if the phone were out of the case. But is it worth it? It comes down to how much you like to use a flip cover, as well as how much you want to protect your phone. The phone can be marked if you drop it and the case will definitely protect against that, and the Dot View mode is indeed very interesting, but what I don’t like about it is what you do with the flap when it’s open. The flap presents a problem of what you do with it when you’re taking a picture. On the LG ‘Quick Window’ covers, the window is positioned so that it fits over the rear camera lens so as not to interrupt the shot, not so on the Dot View case which simply gets in the way. HTC has suggested the best way to get around this problem is to hold the phone in landscape and let it hang, something that portrait videographers out there should take note of. Overall, I use my phones way too much to use a flip cover, the Dot View case though has me second guessing that notion. The possibilities for accessing the screen with it closed, makes for a compelling argument for it, but one that will be stronger once third parties can deliver notifications or controls to it. The HTC One (M8) is a great phone. There’s improved design with the aluminium unibody, the phone is fast and responsive, the software has some great functions and for the first time in a long time is pleasant to look at. While improving over last years model, there are still issues, though: the phone is a bit slippery to hold and can heat up to incredible temperatures, the camera isn’t the flat out winner it should be, and there’s some issues with Bluetooth and GPS. That said, it’s still gorgeous to look at and a pleasure to use. If you’re after a flagship phone this year, the M8 is definitely near the top of the list, but in the end it comes down to the camera. The extra features and effects in the camera software offer a lot of options for people who enjoy sharing photos on social networks, but people wanting great photos at high resolution will have to look elsewhere. The M8 is not a cheap phone, but then no flagship phone ever is. It’s available from Telstra, Optus and Vodafone on a variety of plans, or you can purchase it outright – RRP is $899, although Telstra sells it for $840. Give it a month or two and retailers will begin competing on price to secure your business. If I have an M8 bought in the USA, will it work in Australia? Hi Larry, the M8 in the US does have slightly different 4G bands than the Australian model. Which carrier in the US did you get your M8 through? Unfortunately no, those aren’t compatible with Australian LTE networks. You’ll need 1800MHz for the majority of Australia – with (2300MHz if you decide to use Optus in Canberra). Australia will also be launching 700MHz and 2500MHz networks in the nearish future, but I wouldn’t be relying on those just yet as the rollouts may take some time. It’s also a good idea to check the 3G/HSPA bands as well, in Australia you’ĺl want the 850, 900 and 2100MHz frequencies. K thanks. If I visit for 3 mos I will need a temp phone. I can ask sprint but would data work on WiFi or would the phone not even boot up! In Firefox 28 the text in this article is not displaying correctly. It is truncated on the right-hand side so that the last word or two of each line is missing. love the review and the phone. it’s either this or the Z2 to my replace my Z.
Ausdroid very biased here. I think they have a deal with HTC to keep promoting their product and such high praise. Which part of that is biased towards HTC??? We don’t have any deals with anyone to promote anything. End of story. I think you are being too nice wrt the black HTC band at the bottom Dan. If others can have smaller bezels, why can’t HTC? so does that mean you are happy to be outside of the galaxy walled garden? Interesting – HTC Said it’s the same sensor – You can see why I would believe them. The Telstra note was based on us calling stores and asking. Better to advise than be told some people had been caught out. Power saving mode is only good if you don’t use your phone. News Aggregation is fine for the average Joe, but for someone with specific news feed uses it’s next to useless. Great review, might keep my M7 though. Got to admit, that’s my nightmare there, scratched aluminum, which is why my I’m using a case with my m7. Rather fortunately the M8 is supplied with a basic case which will prevent much of this kind of cosmetic damage.